“What do you think? Thumbs up or down?” I asked Kate and Jess as we watched Morgan and friends introduce us to Gustafer Yellowgold through video and song yesterday afternoon. PPS: It was nice break from High School Musical overload too! Yay! We love gustafer shows (and we have sows of our own almost every night.) ROCKET SHOES! Yay! 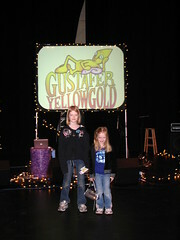 We love gustafer shows (and we have shows of our own almost every night.) ROCKET SHOES!